Suspected bomb-making material has been uncovered during a major security operation in County Armagh. The items and a quantity of fertiliser were found during police searches in the Antrim Road area of Lurgan. Four men, aged 22, 26, 36, and 46, have been arrested and are being held under the Terrorism Act. Police have confirmed they are linking the find to dissident republicans. It is reported that the intended device could have been up to 200lb in weight. 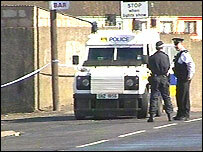 SDLP assembly member Dolores Kelly said she believed that police had foiled a major attack. The discovery is understood to have been made at a vehicle breaker's yard on Wednesday. Bomb disposal officers are at the scene and part of the town is cordoned off. The search is believed to involve dozens of officers and police sniffer dogs. Dissidents republicans are opposed to the Northern Ireland peace process. They have been blamed for a number of attacks and attempted attacks on the security forces over recent years. # posted by SAOIRSE32 : 12:31 p.m.